2. No, it's not ok! Shitkatapult empfiehlt 2 (shitkatapult recommends 2) contains 6 exclusive, unreleased tracks by resident SHITKATAPULT artists. Starting with MOTOR´s fresh acid peace 666% and T.RAUMSCHMIERE´s electro pop song NO, IT´S NOT OKAY! with the great LILIAN HAK on vocals, followed by classical clubtracks by DANIEL METEO and FENIN. The ep gets completed with SUN ELECTRIC´s ACADEMY, an arty maxmsp live session, and the agit tech rock track ZWANG of the Hamburg/Berlin band DAS BIERBEBEN. 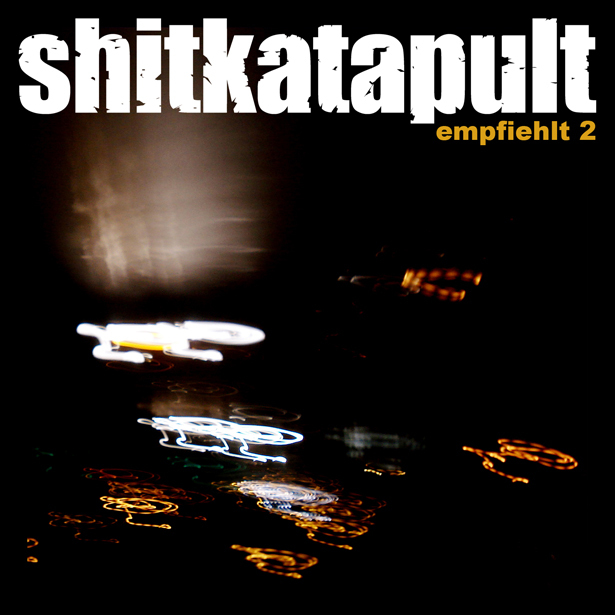 So that Shitkatapult empfiehlt 2, as classical sequel of Shitkatapult empfiehlt 1 (july 08, strike 75), delivers an actual taste of the label’s trademark sound that keeps on releasing music far beyond the tired rules of the electronic music market. Shitkatapult empfiehlt is a continuing range of compilation eps released in digital format.